Hmmmm....prior comments on Toledo from others "exhausted, fatigued, no extra pep in their step, hard fought series".. Yesterday, way before the game, I posted that I wanted to see the "well rested" Komets make the "fatigued" Walleye chase them around the ice. Well, it was just the opposite. The Walleye are more skilled and quicker. Especially when you compare the first two lines of both teams. I know that may sting a little, but it is evident. I suppose that means you've got to have more "banging" (kind of what Wheeling tried). Yesterday I posted that I thought they could get to Lerg (and in a way, they did). They had some pretty nice chances but failed to convert. (How many times will Embach fail while in front of the net? He was doing the same in Kalamazoo). Frustrating? Sure, but it always seemed Toledo could make the necessary breakout passes and enter into the komets zone so easily. 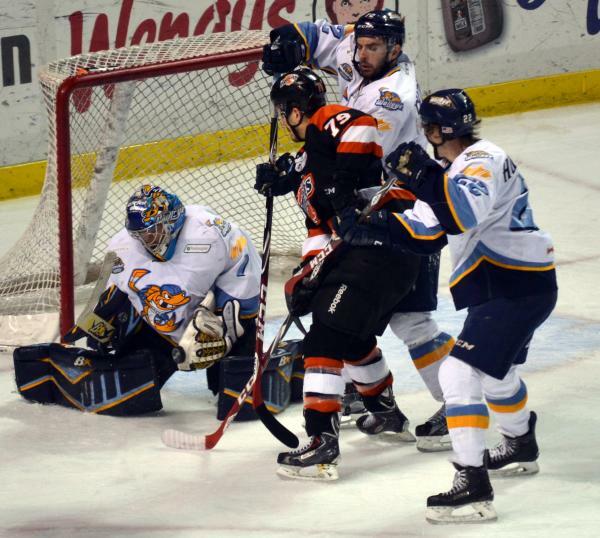 Yet, with the Komets, it seemed a struggle ( and, in truth, it has been so many times this season). This is a very bad time for the "money" line to disappear. I wish the K's could get some continuity on the second line...and please, please never (even if it is an accident) let Lacasse and Barteaux be on the ice together again. (Do you think since we're getting beat anyway, that it might be time to give Kocera a look? If you have no confidence in him, he shouldn't have been brought in). As much as it hurt, I was happy for Daniels' brother (Justin). Did Clarke even play? I haven't checked the scoresheet, but I can't remember. Gary, and I think he's done a phenomenal job this year, can make a lot of changes. To me, if you are a forward who cannot score, you're out. No matter who.